The fake news brigade plays to the tunes of the ‘Aurangzeb Raj’ comment. A photoshopped picture of Rahul Gandhi, Congress party president-designate is being shared widely on WhatsApp. 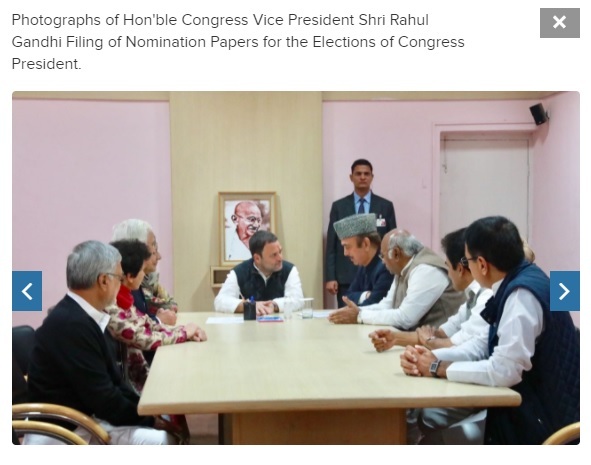 The picture was taken on the 4th of December when Rahul Gandhi filed his nomination papers to become president of the party at the party’s 24 Akbar Road headquarters in Delhi. The picture was taken and photoshopped by the fake news brigade changing the frame of Mahatma Gandhi in the background to Aurangzeb’s. A Twitter handle @Atheist_Krishna who admits to photoshopping pictures for fun on his bio put this out on Twitter on December 4. But for some sympathisers of BJP, this was enough to circulate without any qualification. 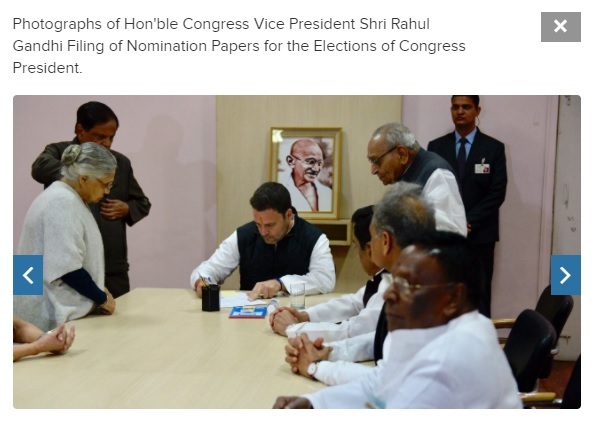 The official website of the Congress party has in its archives the pictures from that day making it clear that the frame was definitely dedicated to Mahatma Gandhi and not Aurangzeb. Posted below are the pictures from different angles. 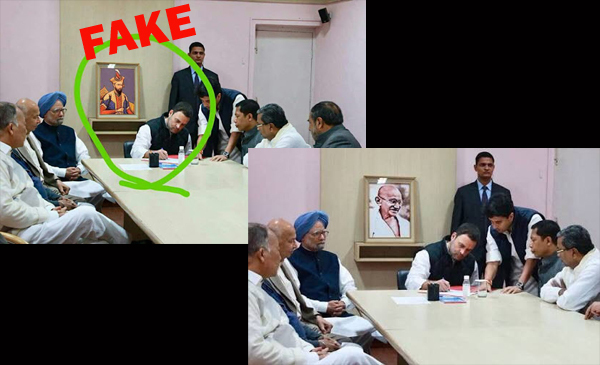 Image shared by Amarinder Singh Raja of the same occasion but shot from a different angle clearly shows that the frame in the room of the party office was of Mahatma Gandhi. 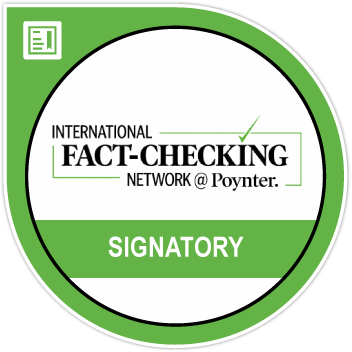 Putting It In Context: Narendra Modi compared Rahul Gandhi’s nomination to Aurangzeb Raj, while speaking at a rally in Gujarat. This was in response to now sacked Congress leader Mani Shankar Aiyar’s statement trying to defend Gandhi’s elevation to the party’s top post. “When Shah Jahan came in the place of Jahangir did any election happen? And when Aurangzeb came in place of Shah Jahan did any election happen? It was known to everyone that the throne of the king will automatically go to the heir,” Aiyar said according to a report by the Hindustan Times. 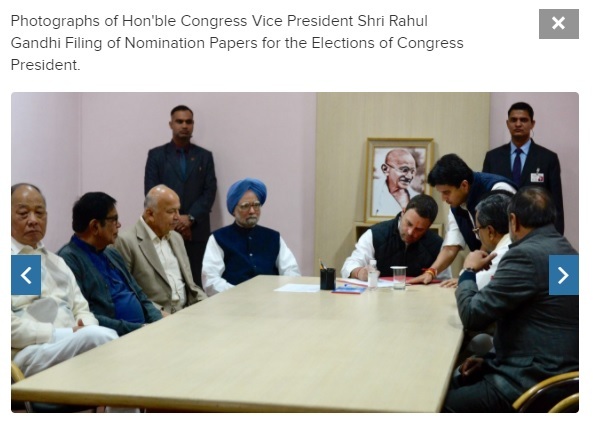 This was in reply to the Maharashtra Congress leader Shehzad Poonawalla’s criticism on the party president election as he called it ‘rigged’ in favour of Rahul Gandhi.